Includes a free preview of future issues in the collection My Country, My Rights . For more information, please refer to the Satisfaction Guarantee tab below. If you do not wish to preview future issues in the collection, you may purchase the single item using the 'Individual Item Only' tab at right. In 1787, as our Founding Fathers debated the ratification of the Constitution, Thomas Jefferson - one of the document's main contributors - argued against a government with too much authority, so he proposed a series of amendments be included to ensure an individual's rights and freedoms. These first 10 Amendments became the Bill of Rights. Having won our independence with everyday citizens who were able to stand up, arm themselves, and fight, the Founding Fathers understood the importance of being able to protect yourself, your property, and those you love. Adopted in 1791, theSecond Amendment states "A well regulated Militia, being necessary to the security of a free State, the right of the people to keep and bear Arms, shall not be infringed" and ensures the rightof law-abiding citizens to own guns. 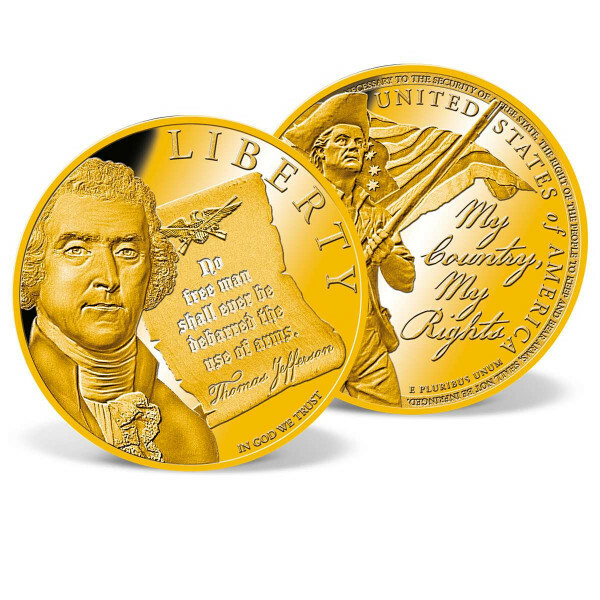 American Mint proudly presents an exclusive 24k gold-layered coin honoring the Second Amendment. The obverse features a portrait of Thomas Jefferson witha quote about the importance of being able to protect yourself and what is yours. On the reverse is a highly detailed image of an armed patriot with the colonial flag waving in the background. Mintedto the highest quality "Proof" standard, this magnificent coin comes in its own protective capsule to preserve it for generations to come!